SALEM, MA – This February, the Peabody Essex Museum (PEM) debuts the first major thematic exhibition to survey the rapidly evolving role of play in contemporary art and culture. Nearly forty works by seventeen leading and emerging artists reveal how behaviors essential to the creative process — risk-taking, exploration, questioning and curiosity — are all encouraged by the act of play. Through large scale installations, video, sculpture, photographs and tactile experiences, PlayTime explores how play catalyzes creative expression, enchants the ordinary and helps us understand ourselves in new ways. PlayTime will be on view at PEM from February 10 through May 6, 2018. PlayTime features three tactile interactive works, including an immersive balloon room installation by Turner Prize winner Martin Creed and participatory One Minute Sculptures by internationally renowned artist Erwin Wurm which invite visitors to become part of the exhibition by striking and holding unexpected poses with everyday objects. Leading contemporary artists from around the globe are exhibited alongside several younger, emerging artists who make their New England debut with this exhibition. PlayTime artists include: Cory Arcangel, Mark Bradford, Nick Cave, Martin Creed, Lara Favaretto, Cao Fei, Brian Jungen, Teppei Kaneuji, Paul McCarthy, Rivane Neuenschwander, Pedro Reyes, Robin Rhode, Roman Signer, Gwen Smith, Angela Washko, Agustina Woodgate, and Erwin Wurm. The world of video gaming, which currently generates more revenue each year than the music or movie industries, offers rich material and subject matter for artists to tackle in provocative ways. Angela Washko’s work, Performing in Public: Ephemeral Actions in World of Warcraft, delves into World of Warcraft -- the online role-playing game with more than 10 million users -- to conduct absurdist performances and engage other players in discussions of gender, sexism and harassment. Her work inside World of Warcraft began in 2012, a couple of years before #gamergate made us all aware of the vicious harassment and threats to which women and gender non-conforming gamers are commonly subjected. By documenting her interactions on the platform Washko doesn’t critique the game itself, but rather gets inside the game to facilitate a dialog about the rules by which we are all agreeing to play. Please join us for a cocktail reception and exhibition preview of PlayTime with PEM’s Curator of The Present Tense, Trevor Smith. RSVP to Paige Besse at paige_besse@pem.org or 978-542-1646. High-resolution publicity images available upon request. Launched in fall 2017, the PlayTime digital platform -- playtime.pem.org -- jumpstarts a conversation about the exhibition’s themes. With fresh content posted weekly, PEM invites the public to explore the shifting role of play in the arts and culture through posts by leading writers, thinkers, gamewrights, poets and artists. Discover new writing on games and society, hear the artists talk about what play means to them, see PEM curators in action and learn how deeply and broadly play has permeated our culture. Highlights include an ongoing series called ‘Dispatches from the Field’ that follows PEM staff on the road, to see the places and meet the players who make up the state of play today. Videos on playtime.pem.org include interviews with artists and thought leaders, as well as creative responses from artists and contributors to the PlayTime manifesto. Under the guidance of curator Trevor Smith, the Present Tense Initiative celebrates the central role that creative expression plays in shaping our world. The Present Tense Initiative engages leading creative agents and thinkers to cultivate innovative experiences fueled by the intersection of cultures, disciplines and technologies. By encouraging innovation and fostering new forms of creativity, PEM seeks to push the boundaries of what a museum experience can be. What does play mean to you? Share your impressions of the exhibition and the digital platform on social media using #PEMplaytime. PlayTime is organized by the Peabody Essex Museum and made possible in part by the Nancy B. Tieken Memorial Fund and supporters of the Present Tense Initiative. Carolyn and Peter S. Lynch and The Lynch Foundation provided generous support. The East India Marine Associates of the Peabody Essex Museum provided valuable support. PlayPower, Inc. is the lead sponsor of this exhibition. PlayTime is presented as part of a citywide partnership of arts and educational institutions organized to recognize the outsized role greater Boston has played in the history and development of technology. The Institute of Contemporary Art/Boston initiated this partnership to link concurrent exhibitions and programs related to the themes of the ICA exhibition Art in the Age of the Internet, 1989 to Today. Information on all the exhibitions and programs can be found at aiai.icaboston.org. 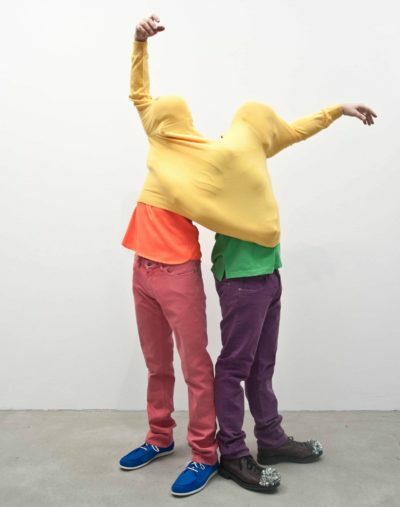 Erwin Wurm, from the series One Minute Sculptures, ongoing, courtesy of the artist. Photo by Elfie Semotan. Over the last 20 years, the Peabody Essex Museum (PEM) has distinguished itself as one of the fastest-growing art museums in North America. Founded in 1799, it is also the country’s oldest continuously operating museum. At its heart is a mission to enrich and transform people's lives by broadening their perspectives, attitudes and knowledge of themselves and the wider world. PEM celebrates outstanding artistic and cultural creativity through exhibitions, programming and special events that emphasize cross-cultural connections, integrate past and present and underscore the vital importance of creative expression. The museum's collection is among the finest of its kind boasting superlative works from around the globe and across time -- including American art and architecture, Asian export art, photography, maritime art and history, Native American, Oceanic and African art. PEM's campus affords a varied and unique visitor experience with hands-on creativity zones, interactive opportunities and performance spaces. Twenty-four noted historic structures grace PEM’s campus, including Yin Yu Tang, a 200-year-old Chinese house that is the only such example of Chinese domestic architecture on display in the United States, and the Phillips Library, which holds one of the nation’s most important museum-based collections of rare books and manuscripts. HOURS: Open Tuesday-Sunday, 10 am-5 pm. Closed Mondays (except holidays), Thanksgiving, Christmas and New Year's Day. ADMISSION: Adults $20; seniors $17; students $12. Additional admission to Yin Yu Tang: $5. Members, youth 16 and under and residents of Salem enjoy free general admission and free admission to Yin Yu Tang. INFO: Call 866-745-1876 or visit pem.org.